The other day, my wife and I had a bad, bad day. She got stressed out about a proposal we were supposed to be sending out. Then she fell on the precarious stone pathway that leads down to the office. The mood devolved from there — she didn’t like our business, our house, the pathway to the office, the chickens or me. So I didn’t like her back. It passed, things went back to normal. 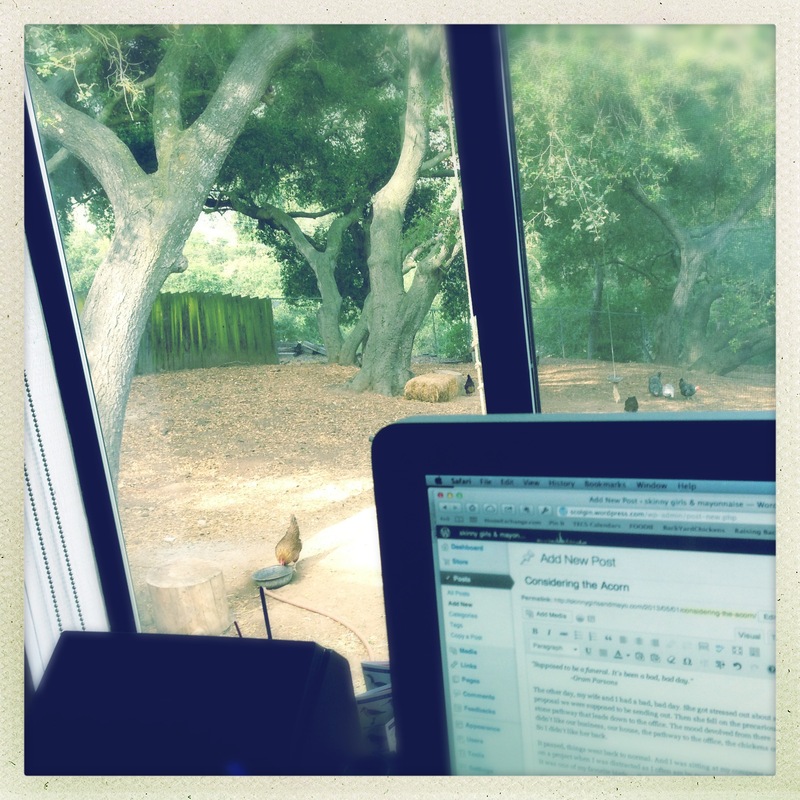 And I was sitting at my computer working on a project when I was distracted as I often am by movement in the trees outside. It was one of my favorite birds — the brilliantly red-crowned acorn woodpecker, hopping up the stout trunk of a towering oak. And I was reminded of how fortunate we are to live here amidst all this wild western beauty. Something I wish we could remember on those bad days. Acorn woodpeckers, as their name implies, are obsessed with acorns. I’m not certain what they do with them, but they are constantly looking for them, or ferrying them about the trees in their beaks. Often I hear a loud tapping on the wall outside the house, and looking out see one pecking the wood siding. They’ve made several silver dollar-size holes in the wood, and sometimes I see a pair flying in and out of a hole, usually bringing acorns. 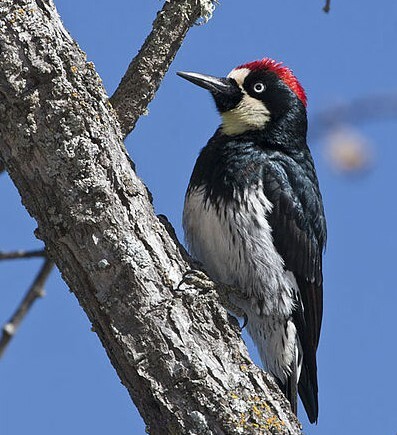 A bit more research leads me to this information: “The Acorn Woodpecker will use any human-made structures to store acorns, drilling holes into fence posts, utility poles, buildings, and even automobile radiators. Woodpeckers put 490 lbs. of acorns into a wooden water tank in Arizona.” My wife and I talk of redoing the siding on our house. I imagine pulling the wood off that wall and being smothered beneath an avalanche of acorns. 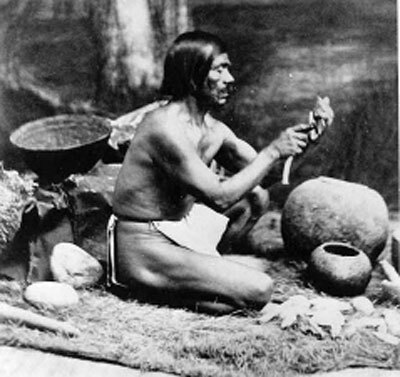 The native people of Topanga, the Tognva, used to pound acorns from the live oaks to make a boiled mush that was a staple of their diet. Bedrock mortars can still be found in boulders all over the canyon. Me, I would’ve headed the couple miles down to the coast and filled up on abalone. But I guess that might’ve pissed off the Chumash who were already there. There are some nature-y granola types in Topanga who for a donation of some kind (sounds more philanthropic than a charge) will teach you how to grind up acorns, soak them to remove their bitterness, and then make mush or a sort of flatbreads with them. I like the idea from a philosophic perspective — it would be good to be self sufficient like the Tongva in the event of Armageddon — more than from a culinary perspective. I went on a field trip the other day with my son’s class to the Chumash Museum, where we learned about the Tongva’s rivals for those abalone. As it turns out, the Chumash ate a lot of acorns too. Our guide, Lisa, demonstrated how they ground acorns up using a traditional stone mortal and pestle. I was reminded of my feelings about the “virtues” of camping. I was deflecting the advances of a friend recently who wanted to go camping. He rambled on about sleeping on the ground in the great outdoors. “Man invented beds and houses. You don’t have to do that anymore,” I replied. I think I’ll leave the acorns to the woodpeckers and Armageddon. I have been wondering about acorn starch ever since I saw it in a Korean market recently. Great post, by the way. Ain’t marriage grand?